Garment Bag https://www.review-australia.com/au/garment-bag/RE19BAGL.REMUL001.%24NA.html Store and protect your beautiful Review pieces in our beautiful floral printed garment bag. These bags are ideal for protecting your Review clothing from dust and moisture, and are also ideal for transporting special dresses while travelling. 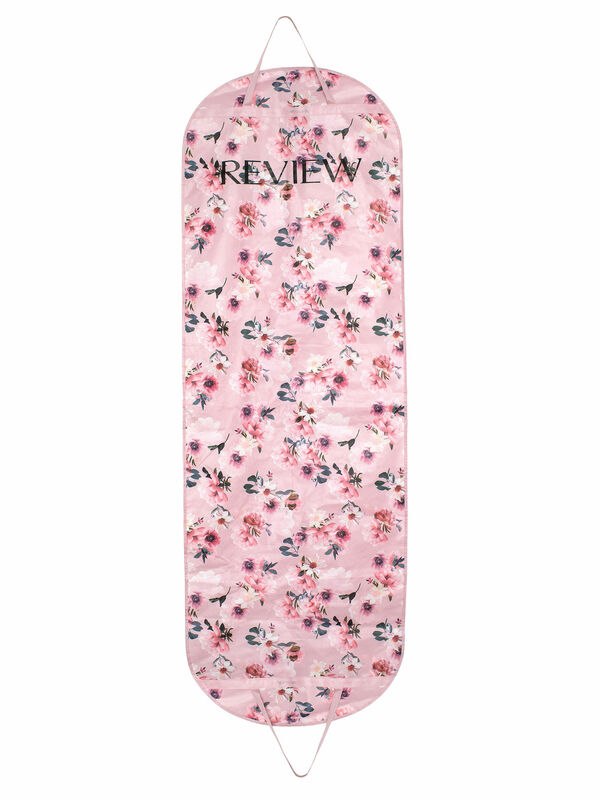 With a beautiful floral print and Review branding, our garment bags are too cute to resist!. Garment Bag is rated 4.9 out of 5 by 48. Rated 4 out of 5 by bsande from Super convenient I bought this to protect my delicate review dress for travelling to a wedding. Pretty and functional - I won’t lose my dress in this. Rated 5 out of 5 by SharonT from Classy Garmet Bag for Travelling in Style I am falling in love with this beautiful bag, it is elegant, sturdy and long. My gown fits perfectly in it and I honestly feel a bit posh arriving at hotels watching the bell ball carry the bag to my room. Less stress for me knowing that the dress will be straight and ready for the night ahead. Rated 5 out of 5 by Katten from Beautiful fabric Lovely customer service in the adelaide store, bought this for my court house wedding and it's perfect. Really surprised how great of a fit it was, I have a very large bust but was able to get the size 12 and fits like it was altered. Very pleased. Rated 5 out of 5 by Digijewels from Gorgeous and practical! I purchased these beautiful garment bags for wedding and bridesmaid dresses, they are the perfect length and so very pretty. The girls absolutely loved them and aee looking forward to using them on mini getaways! Rated 5 out of 5 by Jsby5h from Lovely, long and well priced Better then any other garment bag, designed specifically for a review gown. Walking out of the store with a dress in one of these bags makes you feel like a star, even just for a moment.